An effective site map helps visitors understand the architecture of your site and locate information. All too often, though, site maps either convey too little information or suffer from "sprawl." If you do, you can upgrade your static old site map into a dynamic new one. A SpicyNodes site map can chart more pages while appearing less overwhelming than one displayed as a list or a table. If you don’t, SpicyNodes is a great way to get started. The majority of web site visitors use site maps from time to time, and it’s a great way for visitors to see your site at a glance. Where am I? Where am I going? These are the key questions your visitors ask. With SpicyNodes, the answer is clear. Your site map is displayed radially, and only one level of pages is displayed at a time. So even if you have hundreds of pages, visitors aren’t flooded with information. Instead, the visitor starts on a home node, with only your first-level pages visible. After your visitor clicks a node, the second orbit appears, and so forth. The result is that you can have a more detailed site map, while appearing less overbearing and complex. Best of all, you can draw visitors in with SpicyNodes’ fun and inviting interface. On a technical note, SpicyNodes has an open XML interface, and programmers can automatically sync your nodes with your content management system. Improve sales and visitor satisfaction. 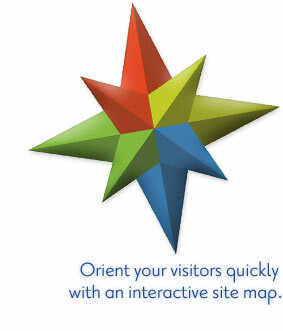 By using SpicyNodes for your site map, visitors have another way to quickly find what they need. They’re pleased, they gain confidence in your business or organization, and they stick around. That’s when they buy your products or engage your services. Stay manageable. Since only one orbit is visible at a time, your visitors will never feel like they’re drowning - no matter how many pages you add. And, there’s no limit on the number of pages that SpicyNodes can handle. Easy to implement. SpicyNodes is easy to edit with a drag-and-drop editor, and is customizable to fit the style of your site. Easy to get around. Visitors can search your new site map, or zoom in to a node to view a preview of a page’s contents. If you have a content management system, visit SpicyNodes’ developer documentation to learn about integration.